From fighting in the skies to submarine warfare, dive into the action of World War II. A book of awesome facts and eye-popping big stickers from the experts at Usborne. 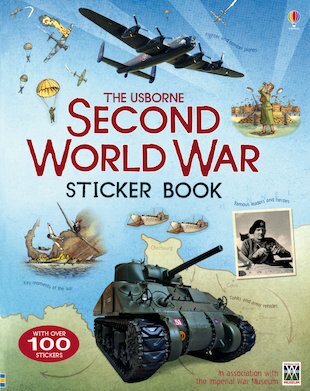 With a special focus on Second World War military vehicles, this cool book has pages and pages of fighter planes, bombers, Allied and Axis tanks, warships, submarines and much more. Check out facts, stats, maps, true-life war stories and wartime posters, plus a short history of the war. Then get busy with 100 massive stickers. Add them into the book, or use them to create your own sticker battle scenes.